Wherever your personal preferences lie, few records can be as hard-hitting and profoundly impactful as the new album from Michael McDermott. Like an unleashed creative force, this Chicago-based artist rips through the tough singer-songwriter landscape with an abundance of folk rock infused lyrical essays as he ultimately comes to terms to a life in some remnant of control. Burying yourself into the avalanche of OUT FROM UNDER rewards the brave and provides credence to the proverb ‘no pain no gain’. Faint-hearted fantasists may need a warning, but immersion in this record toughens the mind and clears the passage for powerful song writing to etch a distinctive mark. It helps that a voice as rugged as the stories told pours gut drenched emotion into each song. A sense of liberation flows from artisan to partisan as these eleven solo-composed tunes take hold. Although Michael has been an active performer and writer for many years, it is mainly through his work as half of The Westies duo, and the last solo release WILLOW SPRINGS, when the focus has moved onto an international stage. From a personal perspective, an impassioned live performance rammed home the magnitude of what this artist is capable of and thus created a relished anticipation for the next chapter. The breathless journey begins on ‘Cal-Sag Road’, a destination stained with a gruesome song drift climax and a stark reminder of demons continually recalled in ‘we’re getting drunk again’. As the tempo picks up, so does the intensity of the songs, from the rootsy and repetitive ‘Gotta Go to Work’ to the deep digging rocker ‘Knocked Down’, which our architect ‘knows a thing or two about’. The opening quartet ends still in rocking mode and a roam around some stark reminders of why ‘Sad Songs’ reign supreme, even if tiredness takes root. The production fluctuates between heavy and sparse mode allowing a fiery Celtic spirit to force the pace. A full-on demeanour grinds out a deluge of passionate storytelling, and a lyrical content making compulsive reading in tandem with the hooked in listening. Among the gruffness, periodic bouts of soul do seep out to add another dimension to the music of Michael McDermott. Back to the tracks and ‘This World Will Break Your Heart’ is full of characters burdened with tragic tales. Up to now, an up tempo beat has juxtaposed with the gritty content, and the sound slips further into a lighter direction with the title track ‘Out From Under’ at the heart of the record. All of a sudden, blatant optimism breaks out in the strident positivity of ‘Celtic Sea’ and blessed sentiment resonating in ‘Rubber Band Ring’. The latter is a big-hearted retro soulful pop piece, surprising in inclusion, but belt out with the most sincere of meaning. ‘Never Going Down Again’ resumes the rocking theme in an absolute bout of feisty defiance before the perplexing lyric-laden ‘Sideways’ takes control in the penultimate slot. Interestingly, the demons re-surface as an untimely reminder, along with a reference to Stephen King, who is an unlikely advocate of Michael’s work as a songwriter. As closing track ‘God Help Us’ ends, the listener is left exhausted though fully rewarded. At this point, a focused state of mind will have played a major part, but you will become a fully paid up member of the Michael McDermott appreciation society, a growing band of enlightened followers. The backstory to Michael McDermott undeniably plays a part in his music, especially in 2018 where a state of placidity and gratefulness fuels the process. 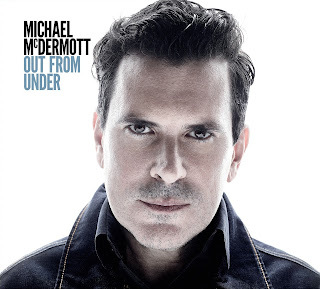 OUT FROM UNDER is an absorbing record which when fully digested in context adds weight to the lofty credentials of a songwriter soaring in a trajectory towards the peak of their powers. A must for any lyrical junkie and fully equipped with an accessible soundtrack to boot.